Sam Burgess: is he meeting the expectations? After representing England at union for the first time, playing in the Saxons' 18-9 victory over Ireland Wolfhounds, much was made of Sam Burgess's performance. In the November 2014 issue of RW we asked some converts how he'd do. Has much changed? AS ENGLAND prepares to be patriotically stretched out in white and splashed with red in the build up to the World Cup, it is hard to ignore a growing sense of hope. Not the kind of fluffy hope that gently nudges lovers to propose and spoilt kids to ask for puppies. This is a harder kind of hope. A steely hope. England’s union believe some players from rugby’s other code can aggressively slash and pummel them through the biggest international competition to be staged on their battered shores. As one of league’s biggest names, Sam Burgess, arrives back on home soil after plying his trade in Australia’s lustily physical NRL, there is a murmur of expectation. Slammin’ Sam has been a big hitter over there with the South Sydney Rabbitohs and now he has turned to union, Bath and England. He wants success and this season is the right time to try to get it, be it at centre, where he will begin his union odyssey this month (this was first published in October), or in the back row of the forwards, where Bath’s director of rugby Mike Ford hopes the bruiser will eventually end up. the unknown about the switch. We tend to think we know how the code hop goes, after seeing Jason Robinson embarrass all comers while other converts never really hit the heights we expected them to wallop. Chris Ashton, a man who has both thrilled and spilled in an England shirt, has spoken about the switch some players make. He has talked about his England team-mate, fleet-footed Kyle Eastmond, who last term endured an Aviva Premiership season as predictable as a game of pin the tail on the donkey played whilst riding an actual donkey. The winger makes it abundantly clear that Eastmond is still learning. This sounds promising and, despite a brilliant showing against New Zealand in the first Test of the summer tour and a dire display that saw Eastmond substituted at half-time in the last match, the lively centre tended to agree. Clearly Eastmond has something about him, he’s started this season in brilliant form for Bath and has played scintillating rugby over the past few seasons. But so soon after England centre Joel Tomkins, who converted from league to sign with Saracens, left union to return to his first code with Wigan Warriors, should we be expecting more from the game-swapping backs? Someone who has done that thankless dance before, Henry Paul, doesn’t think so. “We can’t all be like Jason (Robinson). There are thousands of union players who are nothing like him, too!” Paul proclaims. “Maybe Joel Tomkins just didn’t enjoy union and wanted to change again. The thing is: you get a bit more time to prove yourself in league. In union every man and his dog has an opinion and it is only the Internationals they care about, so if you don’t have a top game you are dumped. Look at me after one game versus Australia or Mat Tait after that famous game against Wales. Of course, Eastmond as a flitting back could potentially go on to prove himself as a valuable asset in England’s midfield, but already there is a sense from experienced code-switchers that you can rarely predict how long it will take for potential to be realised by any player, particularly the converts. Folau has flown as a Wallaby since switching codes and before him the likes of Wendell Sailor and Mat Rogers did fairly well. England have had Robinson and Ashton, and Eastmond is still plugging to get there. Maybe we are wrong to make assumptions? The expectation is there, and former converts like Paul feel the spotlight is on evolving league boys more than others. That sounds pretty tough. However, it would be remiss to label this as totally crippling. After all, if Eastmond is to make it as an international playmaker and Burgess is to be that beautiful brute the English fans hope he will be, there is a personal responsibility. Eastmond is as brusque as possible on this specific point, saying that he understands pressure, but he “couldn’t care less what other people want to see” as long as he has his own lofty ambitions. Noble. But not easy, no matter how well players handle pressure. Carney does not count himself as one of the success stories in this tale of changing games. He was capped, won trophies with Munster and made friends for life, but he does not see his union career as a glittering triumph. However, he values his leap of faith and appreciates the grit it takes for youngsters to make the same choice earlier. Yet he does feel that Eastmond would be even more capable of blowing a game off its hinges in union if he had stayed in league, with St Helens, for a little longer. “Kyle has a bit of that ‘once-in-a-lifetime athlete’ ability that Robinson had. In my opinion he should have stayed in league a bit longer, as half-back. In union a scrum-half is wasted while the first five-eighth takes the ball. 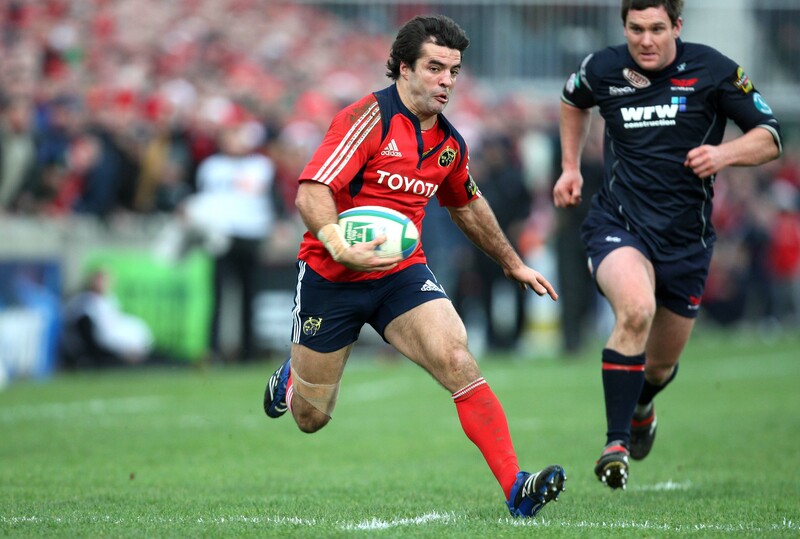 In league the scrum-half can attack the line and can learn an awful lot about attacking. he could then go to union as a senior player from league. This statement may seem like a stab at explaining why Eastmond went from exuberant brilliance in one All Black Test to abject defensive blunders in another, but it also opens up the two elements of the switch that almost all converts struggle with. Firstly, players must accept that some union fans simply do not appreciate a nuanced difference between league players and their styles but secondly, and importantly, they must come to terms with the skills almost all union players have been perfecting since their childhood. Having switched the other way, leaving Sale Sharks to join Wigan Warriors, robust No 8 Andy Powell was taken aback by the technical aspects of league missing from union. “In that first game I thought, ‘Bloody hell, what have I got myself in to?’” says Powell. “There is a lot of grappling. People get tight and try to push you onto your back. When you are tired it’s hard to keep that going. Also, when someone bursts the line you have to get back onside quickly, then again and again. It’s a different fitness. Rucking: it’s something that you could put down as elementary for good, smart athletes, but this would be to dismiss the thousands of hours of practice most union players have had throughout their life. Carney explains how he was “blown away” – especially when he saw seasoned veterans like Paul O’Connell and Dennis Leamy “re-learning” elements with renowned forwards coach Laurie Fisher at Munster. Paul laughs about tripping over Andy Gomarsall in training because he was not used to the basic rhythms of union practices and team plays. Brad Thorn, a man who has gloriously excelled in both codes, playing in State of Origin and for the Kangaroos in league and winning the World Cup, European Cup and Super Rugby titles in union, also chuckles at his own stark realisiation about the extensive technical challenges of union. “Put it this way: if I had known what I was getting into I wouldn’t have switched!” the big man now at Leicester croaks, laughing. “I ended up in the second row, but my first game was played at No 7. Playing in the back row or No 8 is something you get used to playing at a young age. It’s important to have a connection with the half-backs and you need to use a lot of a specific skill-set. That’s not easy. Thorn cites Burgess’s own drive, having overcome the death of his father at a young age to succeed in sport. He has a trio of brothers he is pushed to impress and he is a hard grafter. Sure, perfecting skills can be frustrating – according to Thorn it is easy to work on skills in isolation in league, but in union you need lifters, guys to hold pads and bodies to work with on the deck. Nevertheless, it is a necessary evil, and winners put in the hours of toil. The motivation for moving from league to union is often put down to money; a label of ‘mercenary’ slapped on some players. But according to Chev Walker, the Bradford Bulls player who left Leeds Rhinos for union but lasted only one season with Bath, it is so much more than that. Burgess has played Super League and NRL. He cannot play in State of Origin and international rugby league is largely uneventful. Yes, he can make some money in the game, but he is also a competitor. One Walker feels, due to the increased defensive intensity of NRL and his experiences in the “attacking” Super League, could be the English side’s answer to Sonny Bill Williams. Anyway, according to Ford, Burgess’s DoR at Bath, he will be specifically catered for, alongside Eastmond. Hang on England; these two players need to be treated the right way with their club first. “The thing with Kyle is that he has a certain skill-set, and we signed him because of that,” Ford tells Rugby World. “We have got to come up with a plan to extract that. There’s no point having this ball player who can create and then playing him on the wing, for example. Ford feels that he has two very different athletes on his hands; two vastly different centres. A skipping, fizzing creator and a one-man whirlwind. He has a job on to juggle the two, particularly if he plans for one to play in the forward pack eventually. Thorn says such a positional switch may be humbling, but the rewards can be great. So if these two are handled properly, not only should Bath benefit, but those hopeful England fans will feel more assured of two talents to rival any convert who has ever made that risky code hop. 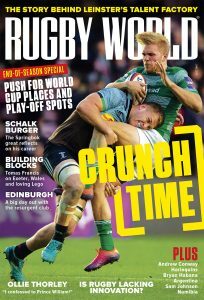 This feature first appeared in the November 2014 issue of Rugby World magazine. Check out what’s in the March 2015 issue – in shops now!